It’s arguably hard to keep up with all the exceptional art exhibits put on in Chicago area museums without some kind of program card. Hopefully the following list for April 2019 will help. April 7,2019 is closing day for these three exhibits in Cultural Center’s first floor galleries. “Furtive,” curated by Filter Photo, is a photographic exhibit that explores personal and collective memory by Daniel Hojnacki, Karolis Usonis, and Krista Wortendyke. “Forgotten Forms” is an exhibition of works by artists exploring everyday objects to tell a story about neighborhood identity and urban life. The artists are members of the Chicago Cultural Alliance the National Museum of Puerto Rican Arts & Culture and the Ukrainian Institute of Modern Art. “In Good Company” is a group exhibition is from seven artists and four volunteers of the Arts of Life studios. Visit artsoflife.org/events/in-good-company. The Chicago Cultural Center is at 78 E. Washington St.. Chicago. For more information visit Chicago/Dept/Cultural Center. 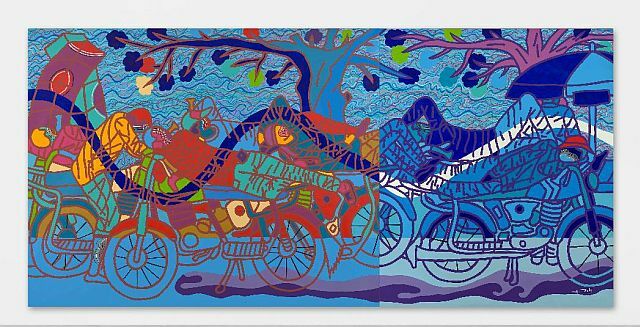 “The Whole World a Bauhouse,” an internationally traveling exhibition making only one stop in the United States, is at the Elmhurst Art Museum just through April 20. The exhibition marks the 100th anniversary of the famed Bauhaus school in Germany. Even though it operated from 1919 to 1933, it had a revolutionary influence on art, architecture and industry. Instructors included such influencers and artists and Mies van der Rohe, Walter Gropius, Wassily Kandinsky, Josef and Anni Albers, Paul Klee, László Moholy-Nagy and Lily Reich. The Elmhurst Art Museum is at 150 Cottage Hill Ave., Elmhurst. For more information visit Elmhurst Art Museum. “The Great Wave” by Holusai will be among the prints explored in Connoisseurship of Japanese Prints in Gallery 107 beginning April 6, 2019. “The People Shall govern!,” opens April 24 in Galleries 1-4. This is the first North American exhibition on the Medu Art Ensemble begun in late 1970s to oppose South Africa’s apartheid. 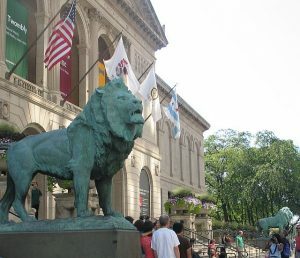 The Art Institute of Chicago is at 111 S. Michigan Ave. For hours, admission and other information visit ARTIC. “Jonathas De Andrade: One to One” opens April 13 with photographs, installations and videos that reflect his take on a northeast area of Brazil. 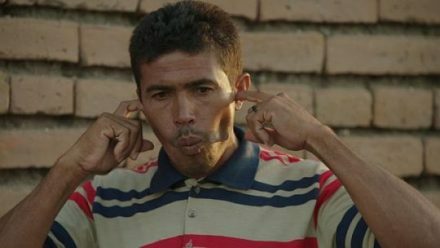 “Can You Hear Me Now,” opening April 27, deals with communication problems in a divisive political climate. The Museum of Contemporary Art is at 220 E. Chicago Ave. For hours, admission and other information visit MCA. A new exhibit at the Museum of Contemporary Art Chicago should have viewers looking at the images, and then, looking again. 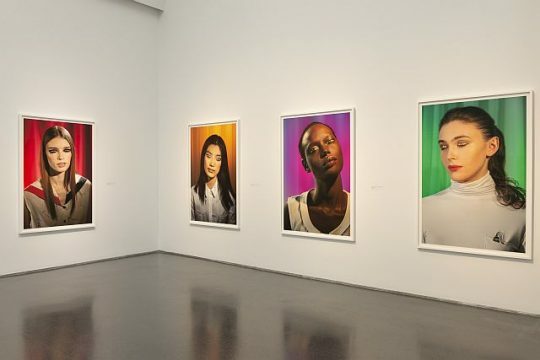 It’s “Laurie Simmons: Big Camera/Little Camera,” a multi-decade exploration of the roles people play, their expectations, how they see the world and how the world sees, or doesn’t see, them. The images in many of the photos are very specifically placed there by Simmons. They are miniature dolls and doll-house objects. They are life-sized dolls. They are puppets. Some are real people. Some have their eyelids closed but had open eyes painted on. Some props are oversized to hide faces so emphasizing the object that was defining them. A see-through box on a long table in one gallery displays a large collection of the miniature items used in some of the photos. Installation view, Laurie Simmons: Big Camera/Little Camera, MCA Chicago February 23 – May 5, 2019 Photo: Nathan Keay, © MCA Chicago. A post-war baby, Simmons grew up at a time when even though Rosie the Riveter had just represented women’s can-do role in a man’s world, the TV ads were promoting products women should use to have the whitest wash, cleanest floors, and makeup that would attract the guys. A major retrospective, the exhibit shows how Simmons interpreted society over four decades. The show includes works from “Cowboys (1979), “Family Collision” (1981), “Color Coordinated Interiors” (1982-83), “Tourism” (1983-84), “Walking & Lying Objects” (1987-91), “Clothes Make the Man” (1990-92), “The Love “ (2009-11), “How We See” (2015) and “Some New” (2018). There is so much to see and think about that the exhibit deserves several visits. 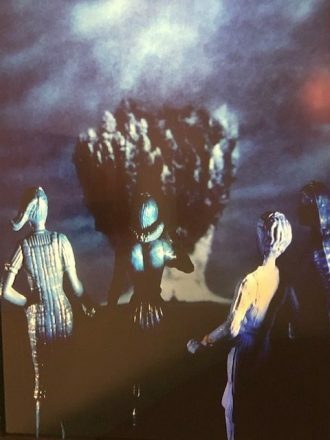 DETAILS: “Laurie Simmons: Big Camera/Little Camera” is at the Museum of Contemporary Art Chicago, 220 E Chicago Ave., through May 5, 2019. For admission, hours and other information call (312) 280-2660 and visit MCAChicago. Try to catch at least one of the places on Art Design Chicago’s free Near North Design Day. Then, from noon to 4 p.m. they range from a clay printmaking workshop with Sharon Bladholm related to “Clay printmaking inspired by Edgar Miller at Art on Sedgwick to a photo workshop from 2 to 4 p.m. at the DePaul Art Museum (935 W. Fullerton Ave) related to “Yasuhiro Ishimoto: Someday, Chicago” exhibition. Art on Sedgwick is at 1408 N. Sedgwick and the Sedgwick Stjudio is at 1544 N. Sedgwick. There is also a viewing of the Roger Brown Study Collection at 1926 N. Halsted Ave. For the complete schedule of places and times visit Art Design Chicago. 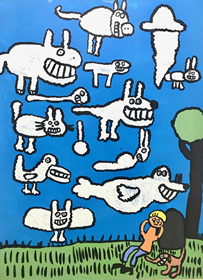 If you haven’t visited the Richard Norton Gallery at 612 Merchandise Mart Plaza, stop by to see “Kenn Kwint Linear Expressions” which opened Nov. 8 and some of the other artists represented by this major Chicago gallery. For more information visit Richard Norton Gallery. “Replay Lincoln Park,” a popular pop up bar at 2833 N. Sheffield is back beginning Nov. 9, The theme this year is “Friends” and includes Monica’s apartment and Chandler and Joey’s place. For more information, please call (773) 665-5660 or visit Replay Lincoln Park. October has enough food, music, art and fall events to fill several calendars. Here are just a few of the events to tack up on the board. “Fields of Battle, Lands of Peace: The Doughboys1917-1918” is at Navy Pier beginning Oct. 5 and continuing through Nov. 18, 2018 in Polk Bros Park (across from the Pier’s entrance). A free exhibit, the works are by photo journalist Michael St. Maur Sheil. Taken over eight years, the compilation tells stories of battleground transformations, peace and remembrance. It works well with Navy Pier’s history. 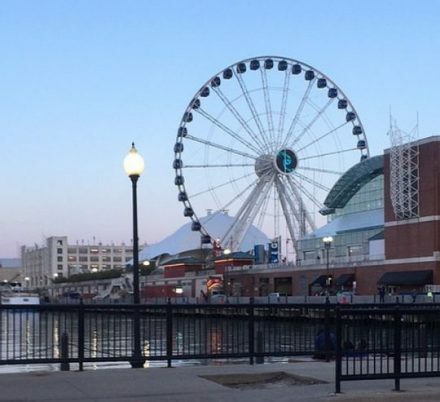 Originally called the “Municipal Pier” it was later renamed Navy Pier in honor of naval veterans who served in World War I. (It became a training center for the U.S.Navy in 1941before returning to public use for an education institution and then an entertainment destination). An opening commemorative event is at the Pier Oct. 5 at 5:15 p.m. followed by the Navy Band Great Lakes Wind Ensemble that plays at 6 p.m. in the Crystal Gardens. For more information call (800) 595-PIER (7437 and visit Navy Pier. Navy Pier is at 600 E. Grand Ave., Chicago. The Chicago Creative Coalition (C3) is holding its 20th Annual Gallery Walk Oct. 18 2018 at four River North galleries. Basically a semi- private tour, the Gallery Walk requires registration. C3 members $15, general admission $20, students $5. Visit Gallery Walk Registration. 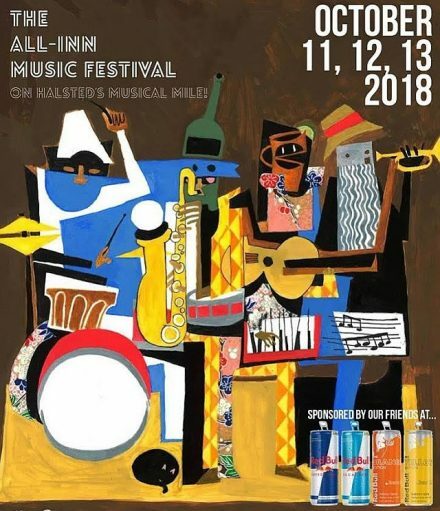 All-Inn fest, a three-day indoor music festival will be at Halsted Street bars from aliveOne to The Store from Oct. 11 through Oct. 13, 2018. Admission is free with a wristband gotten from aliveOne, Tonic Room or The Store. Bar and band hop beginning at 8 p.m. For more information visit Lincoln Park Chamber All Inn. Randolph Street Market goes indoors with Octoberfest Oct. 27-28 from 10 a.m. to 5 p.m. An indoor venue featuring more than 125 vendors, the Market is at 1341 Randolph St. The Octoberfest celebration will have pumpkins but also antiques and clothing. For more information visit Randolph Street Octoberfest. Visitors to the Morton Arboretum can combine leaf looks with the scarecrows, cider and scary adventures of the season at the Morton Arboretum during the Fall corol festival. 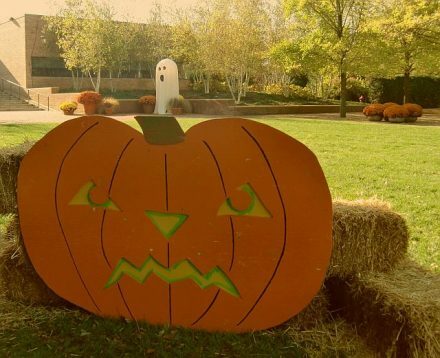 Also, look for the Glass Pumpkin Patch and Jack o Lantern Hikes dates.The Morton Arboretum is at 4100 Hwy 53. Lisle, IL For more information go to Morton Arb. Pumpkins at the Chicago Botanic Garden will be lining the walkways Oct. 24-28, 2018 from 6:30-10:30 p.m. during the annual Night of 1000 Jack o Lanterns. Take photos for some ideas of how to carve your pumpkin next year. 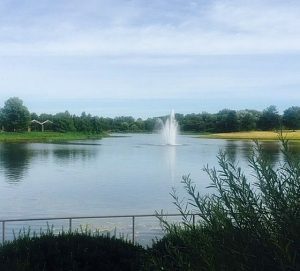 The Chicago Botanic Garden is at 1000 Lake Cook Rd. Glencoe. The event has timed tickets. For tickets and other info visit Chicago Botanic. Basically, it is impossible to walk among the more than 130 galleries exhibiting upstairs in Navy Pier’s Festival Hall without stopping for a closer look at eye-catching sculptures and paintings or fascinating photography displays. A brilliant wall-sized piece by Cameroonian,artist Ajarb Bernard Ategwa stops browsers at the Peres Projects Gallery. It turns out that the gallery is located in Berlin. 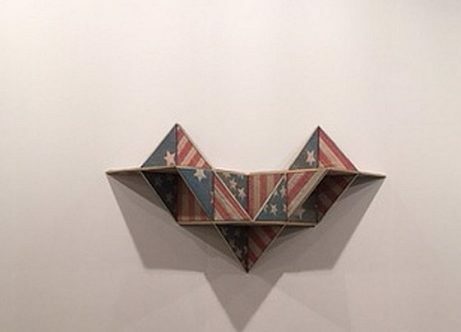 An American Flag sculpture by internationally known, Harlam-based, artist Sanford Biggers, draws visitors to moniquemeloche a popular Chicago gallery with a new West Town location. Nearby the dark works of Dawoud Bey pull people into the shared space of the Rena Bransten Gallery of San Francisco with the Stephen Daiter Gallery “They represent what a runaway slave might be seeing,” said Daiter. In the same gallery are photos by Kenneth Josephson who likes to put scenes into perspective with a ruler or some other held object. 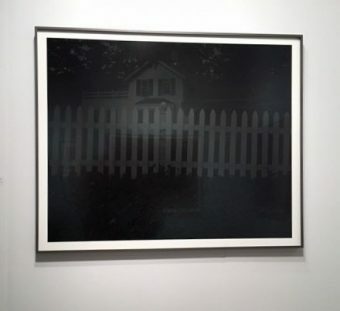 Josephson’s work is featured in a show up now at the MCA that includes some photos on loan from the Daiter Gallery. For Expo Chicago hours, tickets and other information visit Expo Chicago. For more on art in Chicago this weekend visit Chicago becomes art central. Art fairs are a great excuse for forays to Chicago neighborhoods and suburbs. Fortunately, there are plenty to match destination and date. These are some of the area’s better, larger art festivals. Two annual festivals come up this weekend in the western suburbs: the Barrington Art Festival and the St. Charles fine Art Show. Go to downtown Barrington from 10 a.m. to 5 p.m. to see about 130 artists along Cook & Station Streets. For more information visit Amdur Productions. Or go downtown St. Charles Saturday 10 a.m. to 6 p.m. and Sunday 10 a.m. to 5 p.m. to see about 100 artists on Riverside Avenue from Main Street (Hwy 64) to Illinois Avenue. For more information visit Downtown St. Charles. The famed 57th Street Art Fair returns to Hyde Park for its 71st fair Saturday from 11 a.m. to 6 p.m. and Sunday from 10 a.m. to 5 p.m.. There will be more than 250exhibitors near William H. ray Elementary School at 5631 S. Kimbark St. For more information visit 57 Street Fair. There are three good art fair choices the second weekend of June. The Hinsdale Fine Arts Festival and two Near North mega fairs: Wells Street Art Festival and Old town Art Fair. Both have admission charges. See about 130 artists in Hinsdale’s Burlington Park, 30 E. chicago Ave., 10 a.m. to 5 p.m. both days. For More information visit Hinsdale chamber. Visit more than 225 exhibitors at the Wells Street Art Festival between North Avenue and Division Street, Saturday, 10 a.m. to 10 p.m. and Sunday, 10 a.m. to 9 p.m. For more information see Wells Street Art. A couple of large art festivals return each year on the third weekend of June, one in Evanston and the other in Chicago’s Grant Park. Evanston hosts Custer’s Last Stand an arts with an “s” festival in the Main Street Shopping area sponsored by the Evanston Festival Theatre. Visit with about 375 exhibitors from 10 a.m. to 4 p.m. both days. For more information visit Custer Fair. At the Gold Coast Art Fair, held the past few years in Grant Park’s Butler Field, see about 300 artists from 10 a.m. to 6 p.m. both days. For more information visit Amdur Productions. For Head for the northern suburbs for art festivals in Highland Park and Evanston the fourth weekend of June. The Art center (TAC) holds its annual Fetival of Fine Arts along sheridan Road east of the Metra traks downtown Highland Park 10 a.n. to 5 p.m. both days. This is a relatively small fair but it has high quality artists.For more information visit Amdur Productions. The Evanston Chamber Artisan Summerfest features 225 exhibitors at Sherman Avenue and Church Street, Saturday from 10 a.m. to 9 p.m. and Sunday from 10 a.m. to 6 p.m. For more information visit Evanston Festivals. An art festival based on a garden theme takes place in Glencoe the last weekend of June. 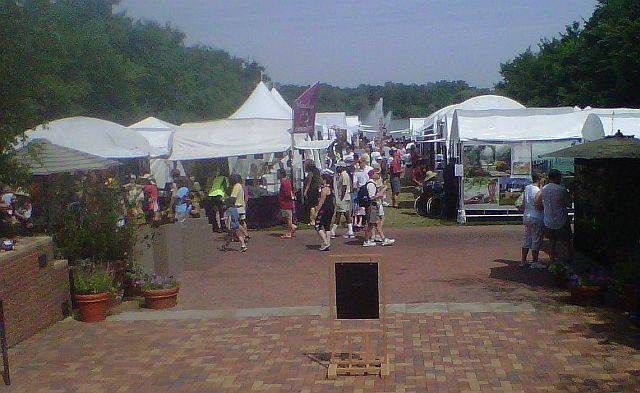 About 100 artists show at the Chicago Botanic Garden Art Festival in the Esplande area from 10 a.m to 5 p.m. both days. For more information visit Amdur Productions. The Chicago Cultural Center is worth visiting at any time but try to get there to see an exhibit up now that brings back Chicago’s musical legacy. You know Chicago’s heart beats in time to jazz, blues and ragtime and turns dramatic with modern gospel. So a new exhibit, starting this weekend at the Chicago Cultural Center, that brings back the history of the city’s music legacy is an exciting event. Up north in Glencoe, an important exhibit is going up next weekend at the Chicago Botanic Garden. It paints eye-catching, environmentally-driven botanical stories. Also next weekend, a world renown painter’s disturbing views of the human condition opens at the Art Institute of Chicago. Then, another picture of life in Chicago, the good, the bad, the real, opens the following weekend at AIC. Located in the Chicago Cultural Center’s Garland and Landmark Chicago Galleries, “Bronzeville Echoes” is filled with such artifacts as 1920s records, old sheet music and even a telephone booth. Up April 28, 2018 through Jan. 6, 2019,the exhibit is an excellent way to become acquainted with the city’s musical history. Presented by the Department of Cultural Affairs and Special Events, entry is free. 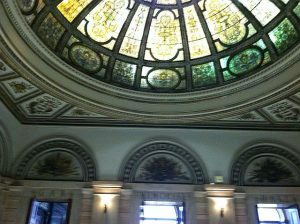 The Chicago Cultural Center is at 78 E. Washington St. BTW The building itself is worth a visit. For more information visit DCASE Events. The show is a non-forgettable statement by Santa Barbara-based artist Penelope Gottlieb on what is happening in the plant world. The works, representative of the three groups: Extinct Botanicals, Vanishing Series, and Invasive Series, range from vibrant to reflective. The exhibit is up in the Joutras Gallery in Chicago Botanical Garden’s Regenstein Center, May 4 to Aug. 12, 2018. The Chicago Botanic Garden is at 1000 Lake Cook Rd., Glencoe. Entry to the Garden is free but there is a parking charge. For more information visit CBG Exhibitions. A retrospective of this Chicago native known for his nightmarish paintings will be at the Art Institute of Chicago’s Gallery 273, May 4 through Aug. 5, 2018. Considered controversial, fascinating and macabre, his works made him the perfect artist to have painted “The Picture of Dorian Gray” for the 1945 movie. For more information visit Albright. Along with visiting old favorite works see a couple of new exhibits at the Art Institute of Chicago. The exhibit, whose title was taken from a Nelson Algren description of the city in Chicago: City on the Make, opens May 12 at the Art Institute of Chicago. Up in Galleries 1-4, the show reveals different sides of city during the second half of the 20th century. “Never a Lovely So Real” is part of Art Design Chicago sponsored by the Terra Foundation for American Art and the Richard H. Driehaus Foundation. It runs through Oct. 28, 2018. The museum’s admission is fee based with some free days and times. The Art Institute of Chicago is at 111 N. Michigan Ave.. For more information visit ARTIC/exhibition. Photo taken by Magnas Wennman of Taman, 5, who is afraid of her pillow because she doesn’t understand it is not the source of her nightmares. 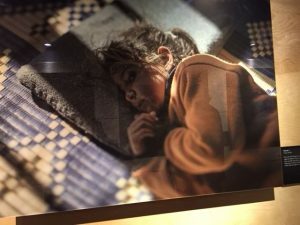 Knowing that the world sometimes forgets how wars, including civil wars, affect children, the UN Refugee Agency, UNHCR in Sweden asked award-winning Swedish photojournalist Magnus Wennman to photograph Syrian children in refugee camps and temporary shelters in the Middle East and Europe. Wennman visited camps in Lebanon, Turkey, Greece and Germany among others where he photographed children as they slept or tried to sleep. 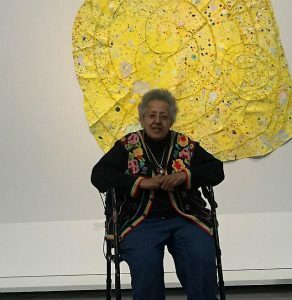 Even though Pindell’s works have been in shows every year for the past several years, the current MCA exhibit is the first, all encompassing survey of her 50-year career. It includes her move from figurative to abstraction and activism to occasional returns to figurative forms. But throughout the periods are personal reactions to what it feels like to be black and female. Yet, the playfulness is evident throughout the exhibit. 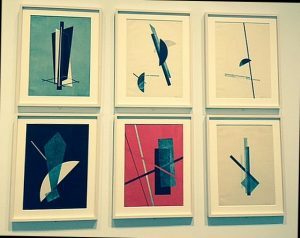 Pindell enjoyed finding different tools and materials to create art including hole punchers, file-folder stock and beveled cutouts found in a museum’s trash where she was an assistant curator. The exhibit features several works where holes were either punched or painted by means of oak-board stencils. Some are best viewed up close to note that works that at first appears monochromatic, isn’t. The show reveals a fascination with numbers, math, patterns and grids. Indeed, visitors who look closely will find numbers in some of the hole-punch designs. Segment showing the artistic use of hole punches. But in some works, the holes are merely a fascinating pattern. 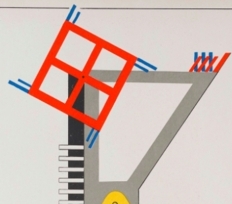 In another series, numbers and arrows add interest to Pindell’s video drawings as if they were instructions. Created on acetate held by static electricity to a television screen, they are an impressive, unusual form of art. 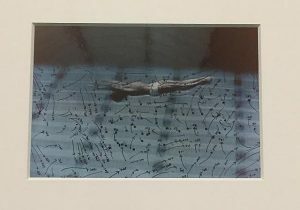 Video Drawings: Swimming, 1975, chromogenic development print from the Museum of contemporary Art Chicago Collection. “I was looking for a fun way to use the videos,” she said. She pointed out that some people thought the numbers and arrows looked like football playbook arrows. Another technique was cutting up postcards from her extensive travels to form collages. Part of her “Autobiography” series, they were memory aids because a life-threatening accident in 1979 included a serious concussion that resulted in temporary memory loss. Work that is play in Pinell’s career is based on a strong art background. 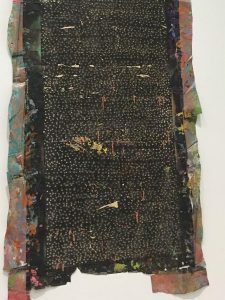 Born in 1943, Pindell graduated from the Philadelphia High School for Girls and studied art at the Philadelphia College of Art and other art schools before getting a BFA from Boston University and MFA from Yale. “They all wanted me to use figurative art when I was moving into abstraction,” Pindell said at the exhibit opening. The MCA exhibit features her different styles. But what also comes across is her use of pattern and color. “Autobiography: Fire (Suttee),” 1986-87 Mixed media on canvas. Collection of Nancy and Peter Huber. Pindell, a longtime professor of art at Stony Brook University, New York (part of SUNY, a state university), stressed the importance of understanding color depth. She pointed out that she focused on the composition of color with her painting students.”They learn it’s not just, “red,” she explained. No matter what the subject or materials used, exhibit visitors will see how Pindell’s use of color is very effective, ranging from ethereal to a rich. She also puts herself into her works, literally. It references a former custom of expecting a widow in India to kill herself after her husband dies. It also stands for human suffering and her own experiences with being black and a woman. Also watch her in the performance video, “Free, White and 21” (1980) when she compares black and white women’s experiences. 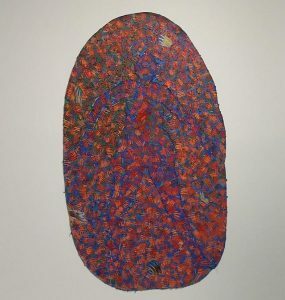 DETAILS: “Howardena Pindell: What Remains To Be Seen,” is at the Museum of Contemporary Art Chicago, 220 E. Chicago Ave., now through May 20, 2018. For more information call (312) 280-2660 and visit MCA Chicago. Sometimes it takes a holiday week or weekend to fit in some of the places we’ve been meaning to go and the shows we want to see. Here are some suggestions to move from sometime to the do now list for the coming holidays.